Are you in the market for a brand spanking new tablet, perhaps one with some gaming integration? 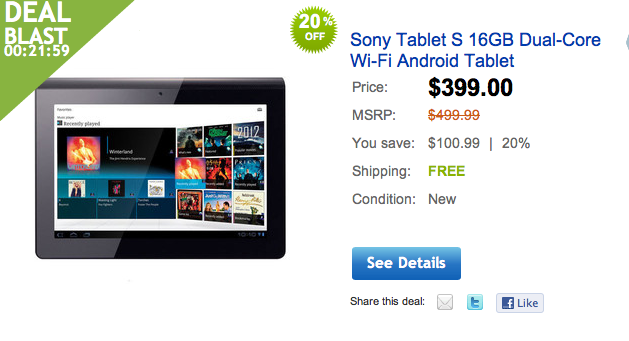 Well look no further than the Sony Tablet S, Ebay’s current Daily Deal. The device is sold through MacMall and can be had for $100 off the MSRP. The Tablet S runs the NVIDIA Tegra2 processor, which gives it access to the stunning games found only within the Tegra Zone (can you say Shadowgun?). Additionally, Sony has packed this thing up with access to some of your most beloved Playstation games. How about it, does the Sony Tablet S for $399 sound like a deal, or are you going to save up and spend an extra $100 on the newly announced Asus Transformer Prime? As with all daily deals, it will only be valid for 24 hours. HTC Won't Be First To Launch A Quad-Core Smartphone? In The Running With Motorola, Samsung, and LG?